, an eminent modern artist, was born at Dalton, in Lancashire, Dec. 26, 1734, where his father was a merchant, builder, and farmer, but derived from none of his occupations more than what yielded a bare maintenance to his numerous* family. In his twelfth year, George was taken from the village school, and engaged to superintend his father’s workmen; his leisure hours he employed in carving; and being fond of music, made a violin for himself, which be preserved till his death. He was first tempted to draw, from seeing some ordinary prints in a magazine, which he imitated with considerable success: and his first attempt at portrait was from memory, when endeavouring to describe the features of a stranger whom he had seen at church. After some attempts by his father to place him in trade, he consented to let him become a painter, and his first master was an artist of the name of Steele, who taught him, to a certain extent, the knowledge and use of the materials of the art. Leaving this master, he began to practise portrait-painting in the country, and being ambitious to try his fate in the metropolis, as soon as he had acquired nearly an hundred guineas, he took thirty for his travelling expences, and leaving the remainder with his wife, set out for, and arrived in London in 1762. 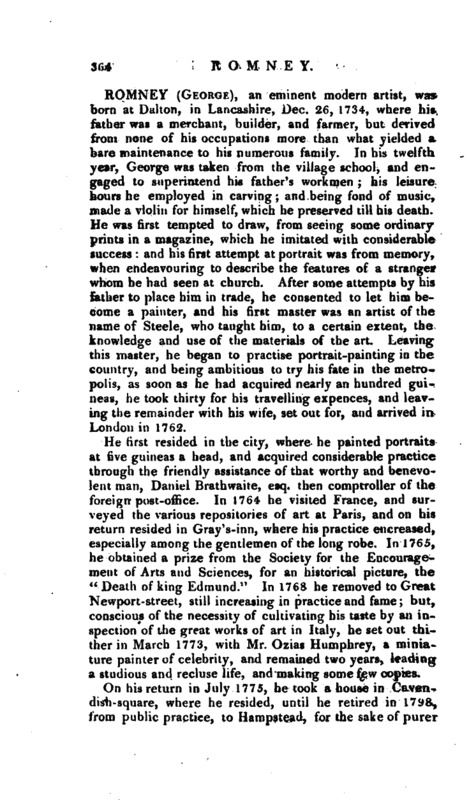 He first resided in the city, where he painted portraits at five guineas a head, and acquired considerable practice through the friendly assistance of that worthy and benevolent man, Daniel Brathwaite, esq. then comptroller of the foreign post-office. In 1764- he visited France, and surveyed the various repositories of art at Paris, and on his return resided in Gray’s-inn, where his practice encreased, especially among the gentlemen of the long robe. In 1765, he obtained a prize from the Society for the Encouragement of Arts and Sciences, for an historical picture, the “Death of king Edmund.” In 1768 he removed to Great Newport-street, still increasing in practice and fame; but, conscious of the necessity of cultivating his taste by an inspection of the great works of art in Italy, he set out thither in March 1773, with Mr. Ozias Humphrey, a miniature painter of celebrity, and remained two years, leading a studious and recluse life, and making some few copies. On his return in July 1775, he took a house in Cavendish-square, where he resided, until he retired in 1798, from public practice, to Hampstead, for the sake of purer | air. During the preceding twenty years, he enjoyed uninterrupted success in his profession, to which he was so ardently attached, that his whole delight was in it. His talents, in return, were highly esteemed, and encouraged by an immense influx of employment. In one year only (1785), he painted portraits to the value of 3635l. His prices now were, for a whole-length, eighty guineas half whole-length, sixty; half-length, forty a kit-cat, thirty; and for a head, twenty guineas. It is very remarkable, however, that he never became a member of the Royal Academy, nor ever exhibited in its rooms. When the Boydeli Shakspeare was projected, Romney contributed his aid. He had a quick and keen relish for the beauties of that poet, although his own fancy was so volatile, and his mode of reading so desultory, that it may be questioned if he ever read, without interruption, two acts of the dramas that he most cordially admired. After he had finished his fine picture for “The Tempest,” he was induced in. 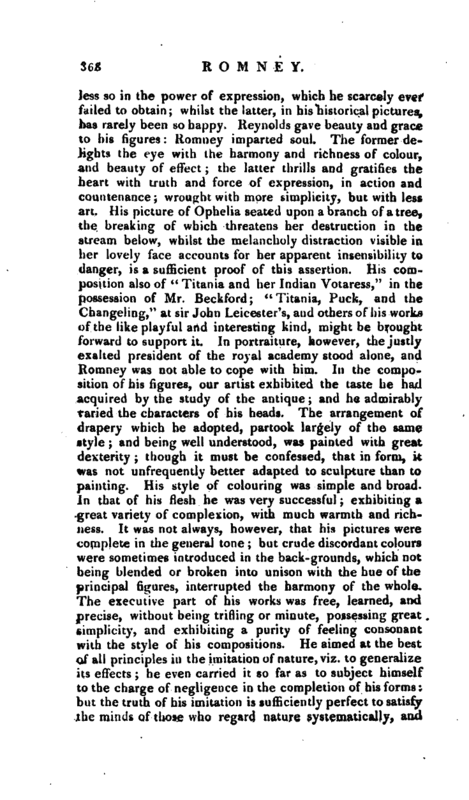 1790 to visit Paris again, with his biographer Mr. Hayley and another friend; but on his return in 1791 resumed his labours for the Shakspeare gallery, and painted some pictures for the prince of Wales. In 179? he felt a slight paralytic stroke, which affected his eye and his hand, and prevented him from continuing his professional labours. 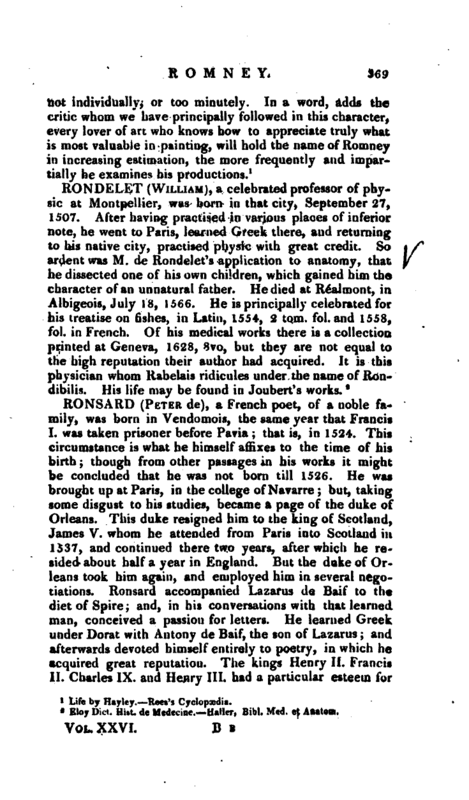 It was then he retired to Hampstead, but, finding his health still decline, he, in 1799, revisited his native country, where he died Nov. 15, 1802. 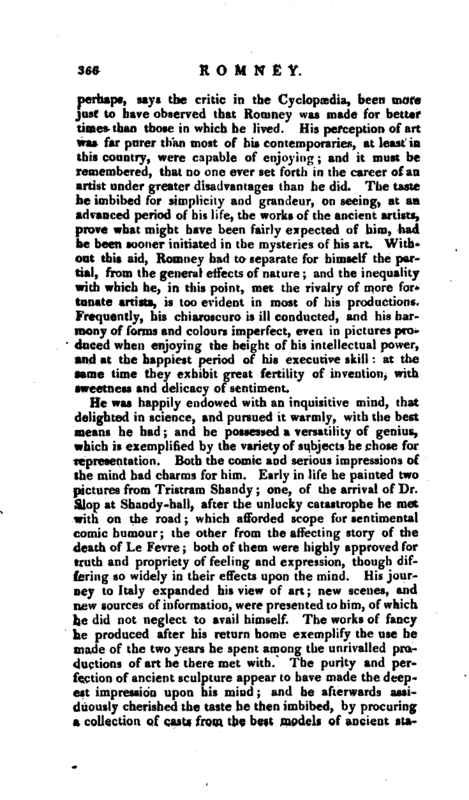 “To Romney as a portrait-painter the public have borne ample testimony; he was made for the times, and the times for him. If he had not genius to load, he had too much originality to follow, and whenever he chose was nearer to the first than to the last of his competitors. Practice had given him rapidity of execution and nature an eye sufficiently just for form, and not ungenial f^r colour. His women have often naivete, sometimes elegance, with an artless bloom and freshness of tint. His men in genei-al have more spirit than dignity, and m re of protence than reality of characler. When he attempts to produce effects by op­ position of colour without decided masses of light and shade, he is not Always happy in the balance: he becomes vivid without freshness, and foxy without glow. Those who wish to form an idea of his historic powers may consult the pictures of the Storm from the Tempest, the Cassandra from Troilus and Cressida, and the Infant Shakspeare of the Bovdell gallery. Romney, as artist and as man, is entitled to commendation and esteem; but his life furnishes a signal proof of the futility of the idea that genius is of a passive quality, and may be laid by or taken up as a man pleases.” Pilkinton by Fuseli. It had | perhaps, says the critic in the Cyclopædia, been more just to have observed that Homney was made for better times than those in which he lived. His perception of art was far purer than most of his contemporaries, at least in this country, were capable of enjoying; and it must be remembered, that no one ever set forth in the career of an artist under greater disadvantages than he did. The taste he imbibed for simplicity and grandeur, on seeing, at an advanced period of his life, the works of the ancient artists, prove what might have been fairly expected of him, had he been sooner initiated in the mysteries of his art. Without this aid, Romney had to separate for himself the partial, from the general effects of nature; and the inequality with which he, in this point, met the rivalry of more fortunate artists, is too evident in most of his productions. Frequently, his chiaroscuro is ill conducted, and his harmony of forms and colours imperfect, even in pictures produced when enjoying the height of his intellectual power, and at the happiest period of his executive skill: at the same time they exhibit great fertility of invention, with sweetness and delicacy of sentiment. He was happily endowed with an inquisitive mind, that delighted in science, and pursued it warmly, with the best means he had; and he possessed a versatility of genius, which is exemplified by the variety of subjects he chose for representation. Both the comic and serious impressions of the mind had charms for him. 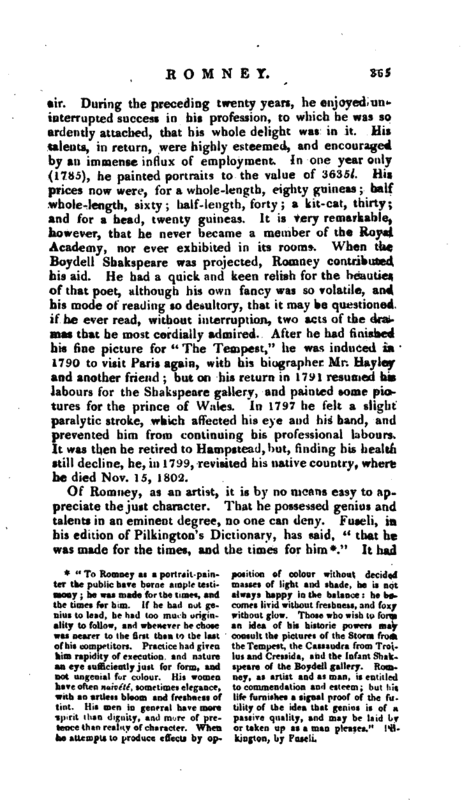 Early in life he painted two pictures from Tristram Shandy; one, of the arrival of Dr. Slop at Shandy-hall, after the unlucky catastrophe he met with on the road; which afforded scope fur sentimental comic humour; the other from the affecting story of the death of Le Fevre; both of them were highly approved for truth and propriety of feeling and expression, though differing so widely in their effects upon the mind. His journey to Italy expanded his view of art; new scenes, and new sources of information, were presented to him, of which he did not neglect to avail himself. The works of fancy he produced after his return home exemplify the use he made of the two years he spent among the unrivalled productions of art he there met with. The purity and perfection of ancient sculpture appear to have made the deepest impression upon his mind; and he afterwards assiduously cherished the taste he then imbibed, by procuring a collection of cast; from the best models of ancient | stathes, groups, basso-relievos, &c. which he would sit by the hour to contemplate; examining their appearances under all changes of sun-shine, and common day-light; and with lamps, prepared on purpose, he would try their effects in various modes of illumination, with rapturous delight. Hence, grandeur and simplicity became the principal objects of his ambition; he perceived these qualities distinctly, and employed them judiciously; even whilst imitating nature in his most usual occupation, portrait painting. To present his figure, or tell his story, with simple undisturbed effect, rejecting all unnecessary minutiae, wa the point he aimed at and obtained. On his return from the continent his zeal for historical painting revived, or rather became strengthened. In several epistles to Mr. Hayley, he laments his confinement to portraits: in one he says, “this cursed portrait painting, how I am shackled with it! 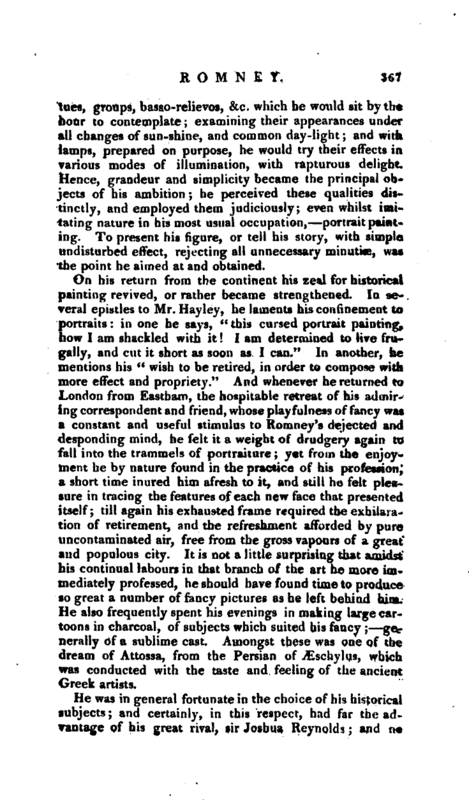 I am determined to live frugally, and cut it short as soon as I can.” In another, he^ mentions his “wish to be retired, in order to compose with: more effect and propriety.” And whenever he returned ttf London from Eastham, the hospitable retreat of his admiring correspondent and friend, whose play fulness of fancy was’ a constant and useful stimulus to Romney’s dejected and desponding mind, he felt it a weight of drudgery again to fall into the trammels of portraiture; yet from the enjoyment he by nature found in the practice of his profession^ a short time inured him afresh to it, and still he felt pleasure in tracing the features of each new face that presented itself; till again his exhausted frame required the exhilaration of retirement, and the refreshment afforded by pure uncontaminated air, free from the gross vapours of a great and populous city. It is not a little surprising that amidst his continual labours in that branch of the art he more immediately professed, he should have found time to produce so great a number of fancy pictures as he left behind him. He also frequently spent his evenings in making large cartoons in charcoal, of subjects which suited his fancy; ge^ nerally of a sublime cast. Amongst these was one of the dream of Attossa, from the Persian of TEschylus, which was conducted with the taste and feeling of the ancient Greek artists. Life by Hayley. Rees’s Cyclopaodia.